The 2018 winner of the Daron Malik Jae Simpson Memorial Scholarship is Kenya Linen. She is a resident of Utica, majoring in Business Management at MVCC. The 2017 winner of Daron Malik Jae Simpson Memorial Scholarship is Tonia Phillips, a Human Services major. Tonia is congratulated by Dr. Randall VanWagoner, MVCC President. The 2016 winner of Daron's memorial scholarship is Cara DeCarr, from Utica. 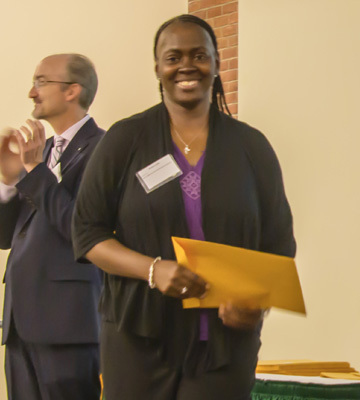 The 2015 winner of the Daron's memorial scholarship is Starkisha Robinson of Utica, a President's List honors student in psychology. Starkisha plans to continue her education at a four-year institution and earn a Bachelor's degree. 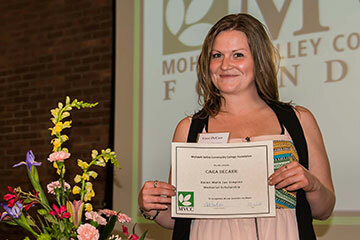 This year's winner of the Daron Malik Jae Simpson Memorial Scholarship for Single Mothers, awarded May 15th. She is Stacey Southwick of Boonville, NY, an accounting major. 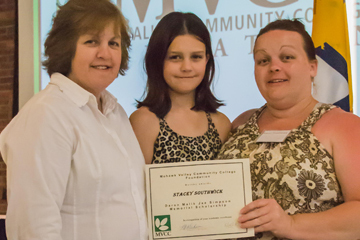 Stacey Southwick, accompanied by mother and daughter. Jasmine Richard, this year's recipient of the Daron Malik Jaw Simpson Memorial Scholarship. 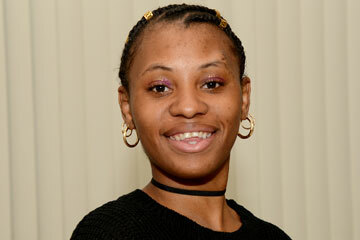 Jasmine resides in New York Mills, and in majoring in nursing. Father's Day - the Magical Way"
Illusionist Leon Etienne performs with his assistant Romy and a volunteer at "Father's Day - the Magical Way" to benefit our scholarship, June 17, 2012, at MVCC. One of our 2012 scholarship winners is Tiffany Young (pictured) of Utica, a liberal arts/English major at MVCC who plans to become a reporter and writer. 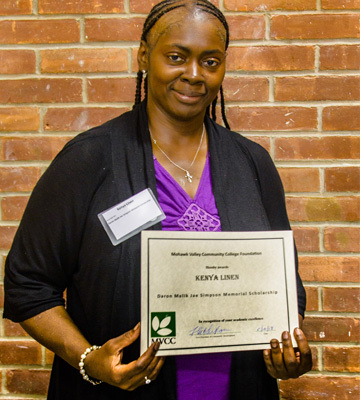 Our second 2012 scholarship winner is Kadeeja Herron, also of Utica, who plans a career in social work. We are planning a fundraiser for the scholarship at Mohawk Valley Community College (MVCC) in memory of our grandson, Daron Malik Jae Simpson, who was killed in 2004 at the age of two. It will be a magic show with locally-based, internationally-known illusionist Leon Etienne (www.leonetienne.com). It is scheduled for Sunday, June 17th (Father's Day), at 2 p.m. in the Information Technology Building theater on the MVCC Utica Campus. Admission will be just $10. We hope you will be able to attend. Additional information will be mailed in May. If you wish to know more about the scholarship, please visit our website, www.daronscholarship.com, or call the MVCC Office of Institutional Advancement at (315) 792-5526. 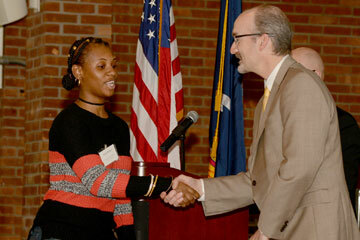 The 2011 recipient of the Daron Malik Jae Simpson Memorial Scholarship is Jameela El-Mohammed of Utica, a business student who plans to work in small business. The Feed Your Soul Food & Music Celebration on June 7th, 2009, raised more than $7,500 for the Daron Malik Jae Simpson Memorial Scholarship. Grupo Pagan, a Latin-American rock group from Syracuse, pictured here, donated their services for the event. Also performing were the Rick Montalbano Trio, and the Carmen Caramanica Trio. The recipient is Jessica Farley from Utica. The recipient is Shannon Hnelosub, an administrative assistant major from Utica. Girl Scout Donates to Cousin's Scholarship Fund. 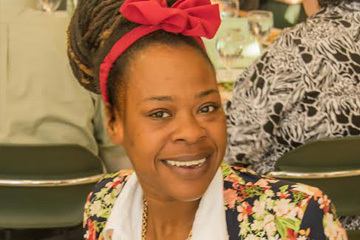 Brie King-Washington, of Utica, who plans to study nursing, received the second Daron Malik Jae Simpson Memorial Scholarship in May 2007. Isabel Sanchez, a criminal justice major at MVCC, received the first Daron Malik Jae Simpson Memorial Scholarship in May 2006. Her goal is a career in juvenile probation. She is shown here with her son, DeMarco.